both the 700c tires are larger and yet they are lighter than their 26" counterparts. MOUNTAIN Bike tires are heavier than ROAD Bike Tires. of course, but not everyone uses a 26" commuting tire in the wilderness trails. That is weird. For the same model, I'd expect the 26" version to be lighter. Construction must be different somehow. Don't assume that all aspects of the same series of tires but in different sizes are all the same. 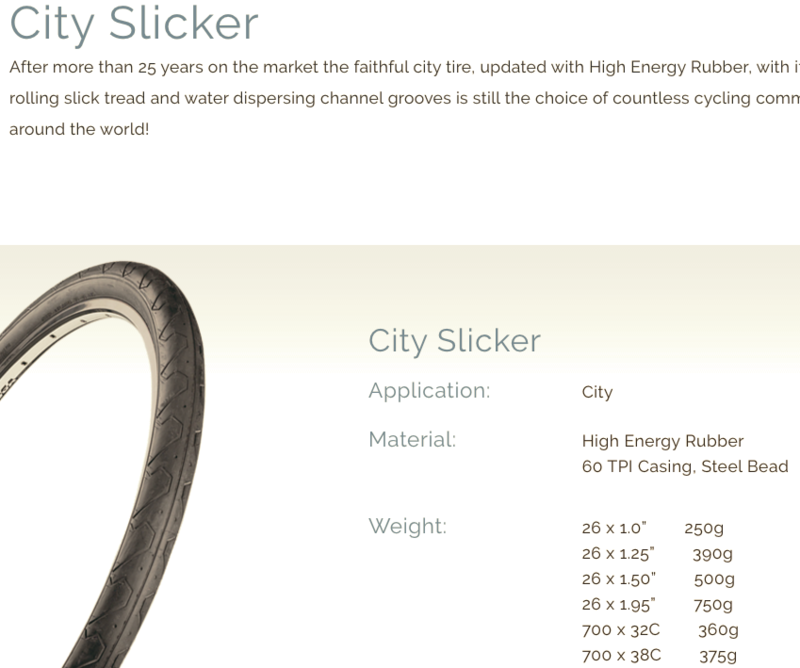 So the 700c tire will share some details (color, tread pattern, casing thread count) but not others (tread cap thickness, casing ply count, rubber grade). Or some such mix of enough of the same aspects to make the claim of the "same but other size" but also address the different use/expectations that the different size customer might have. A popular example of this in the Panaracer Pasela series. The tread depth shifts across the diameter and width ranges. For more tread depth one needs a thicker tread cap. What the series shares is the general nature of the tires WRT the actual sizes. Exactly what the marketing department wants to create a "story" that's easy for the consumer to digest. Andy. When you asked Tioga, what did they say? Maybe square centimeters of material .. Width vs Circumference? You have the math skills to calculate the surface area? Last edited by fietsbob; 10-17-16 at 11:28 AM. Don't assume the mfgr's claimed weights are accurate. Yeah, the comparable sizes' weights are quite different percentage-wise: 1.25" vs 32mm 8% more, 1.5" vs 38mm 33% more. Doesn't make a lot of sense to me.